Take me to the Motherland… The Port-Motherland. A-O River! To all the bike commuters that may or may not have followed the past year of sporadic, wtf, travel-inspired posts, the one and only Mir.I.Am is taking off for the cycle kingdom known as Portlandia. Awwww yeah, birches. I can’t wait to be part of the transportation majority! Clip my feet and grow me a beard, I’m getting a tattoo and retiring in my thirties… Bring it Portland. 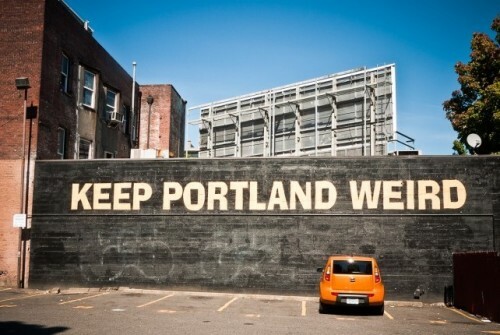 That would be PORTLAND! The MOTHERLAND!!! 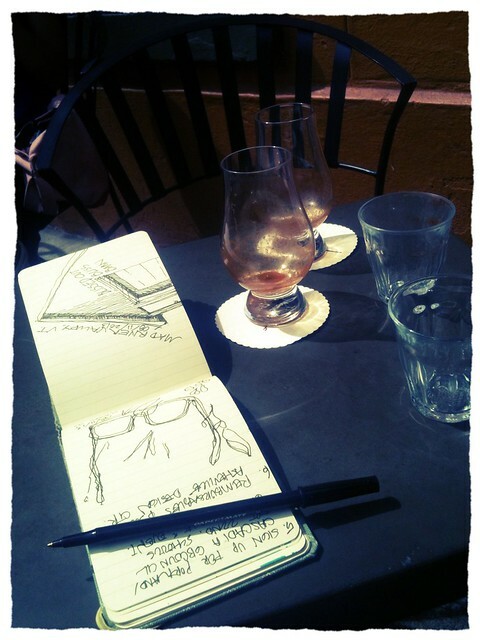 Boyfriend and I have be chillin’ like villains here in the Northwest, revisiting old Seattle haunts, eating blackberries off the side of the road, and cramming our heads full of piping hot brown caffeine juice in the good ole-fashioned PacNoWe way. Yes. I did it. This is an emo-romance moment post fancy coffee and sparkling water with the Boyfriend in Portland. P.S. America, when did you start offering bubbly water with your espressos? I thought it was a Buenos Aires thing. 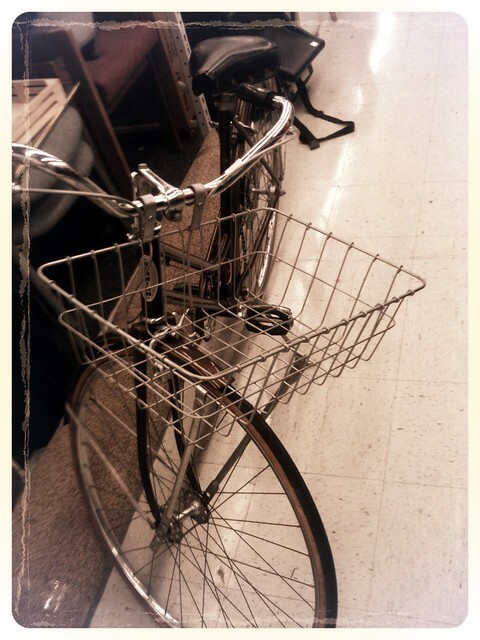 And… You know you’re in the Northwest when the Goodwill has a sweet Schwinn “Suburban” with a front basket and chromed out fenders for $40. A-MAY-Sing. 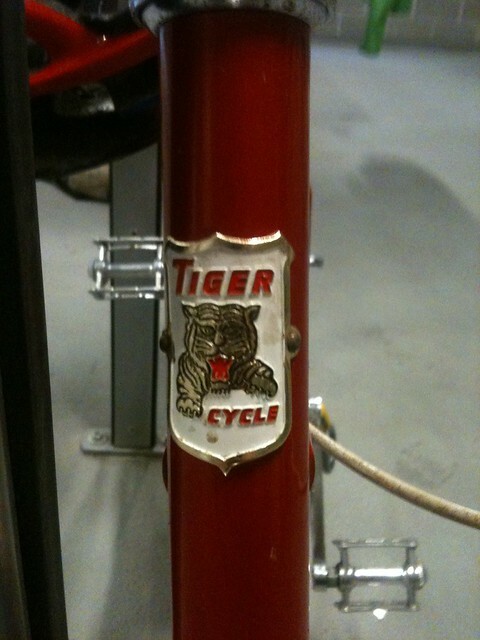 Check out that Tiger’s black leather saddle with SHOCKS. It goes “skreaky-skreaky” everywhere when you ride it. heeeheee. A 70’s Japanese-made Tiger folder, or the-best-guest-bike-ever-for-when-your-friends-are-in-town… Yes, I am 5 foot and peas, and my friend who’s 6 foot and carrots rides this sucker too. 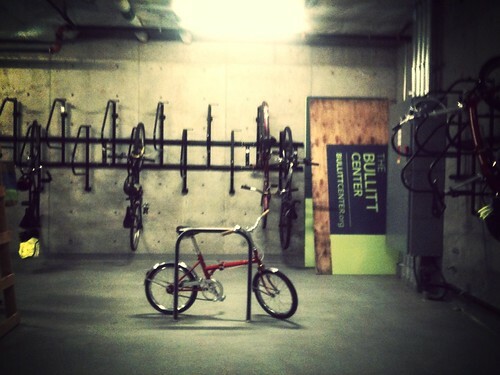 All locked up at this sweet Bike Lounge at the Bullitt Center in Seattle. Complete with Showers and a bike tune-up station. 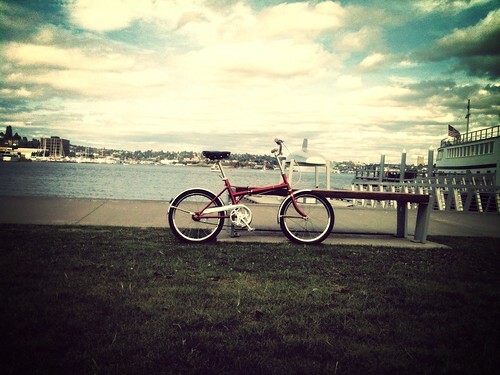 I can’t wait til my sister ships me my old orange Schwinn Le Tour II from San Francisco… In the meantime, I’ll dream of three-speed red tigers rolling through the bougie coffee shops in the ultimate hang town of Portland, Oregon. Any PDX bike commuters out there, hit me up with recommendations for bike-specific awesomeness! 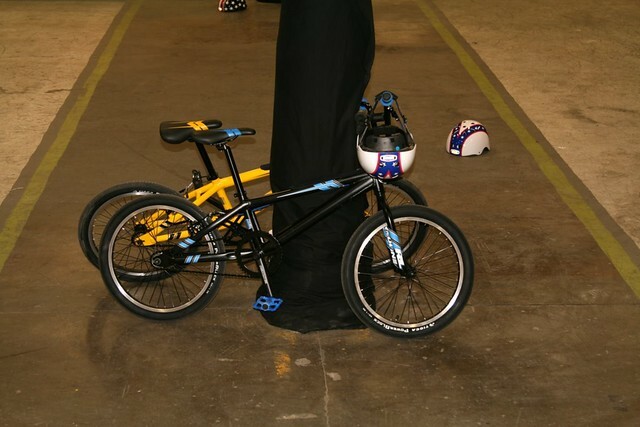 How could you not love this tiny bike?! Tiger-powered! In early 2010, Portland Design Works purchased one of the most interesting installations from a Pomona College student in Southern California… CIRCULUS. 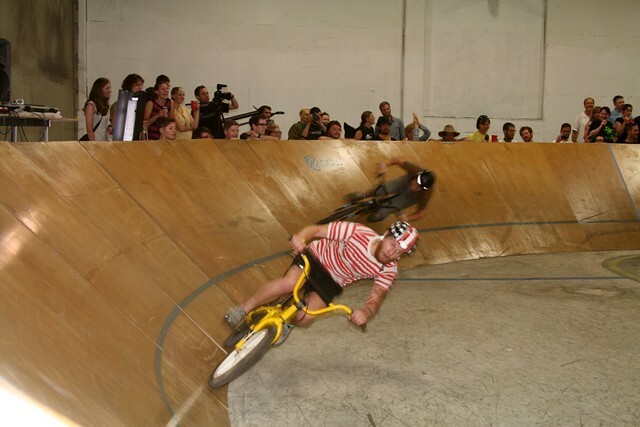 Circulus is a 143 foot diameter, 45 degree banked, wooden mini-velodrome. When standing in the ‘in field’ of the track, it almost feels like you are standing in an enormous wooden salad bowl! 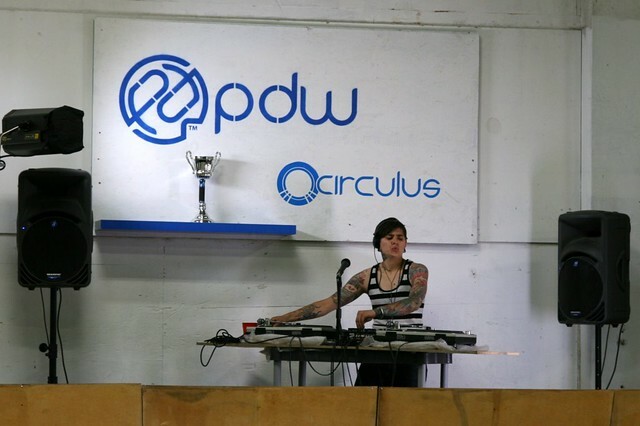 The track is currently housed within PDW’s Portland, Oregon warehouse – The Mothership. 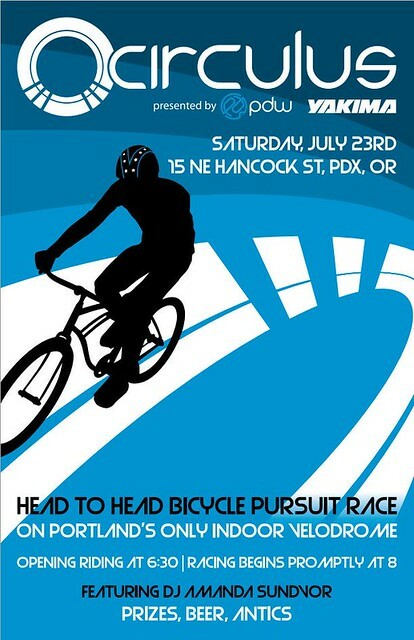 One if the perks of living in the fine city of Portland is I’ve had the opportunity to ride on Circulus. It is AMAZING! 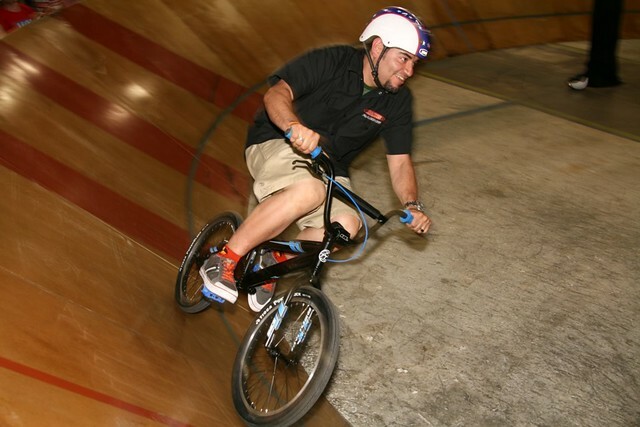 This last Saturday evening, PDW & Yakima Products had an open invite for head to head racing on the track! PDW’s man in the field, Kevin “MURPH” Murphy came by the shop week ago to drop off the event flyer (shown above). There was some discussion on what bikes were to be used for the event. The main concern was rider and spectator safety. 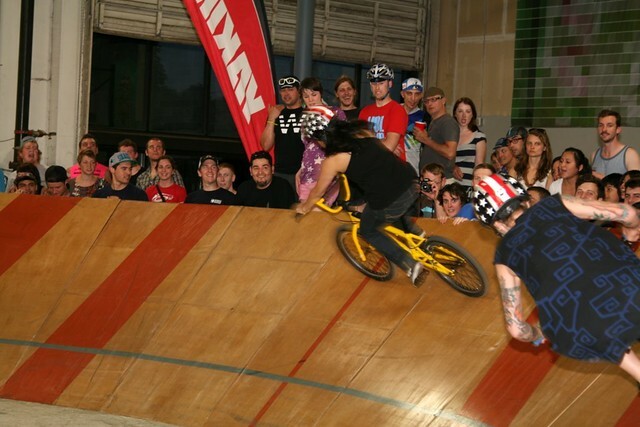 If the bikes were geared too high, riders would be able to reach the top of the track too easily and chance launching off the track and out into the spectator area. If the bikes were geared too low, proper speeds would not be reached to keep the riders on the steep, 45 degree bank. Upon arriving to the venue on Saturday night I was delighted to see bikes that had decent gearing and were low to the ground, in the off chance that if riders had to bail or crash, the fall would not be very bad. Open riding for the evening began at 6:30pm and racing began promptly at 8pm. 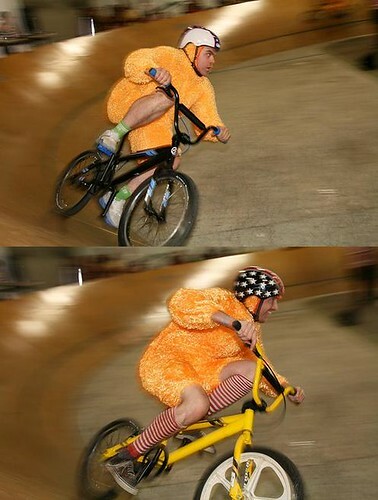 The racing was MC’d by none other than Stevil Kinevil. Being a single elimination race, it was all or nothing for the racers. This was a pursuit style race. The race began with each competitor begining at opposite sides of the track from a dead stop on the infield floor. Each racer had to be up on the 45 degree banked track within 1/2 a lap. 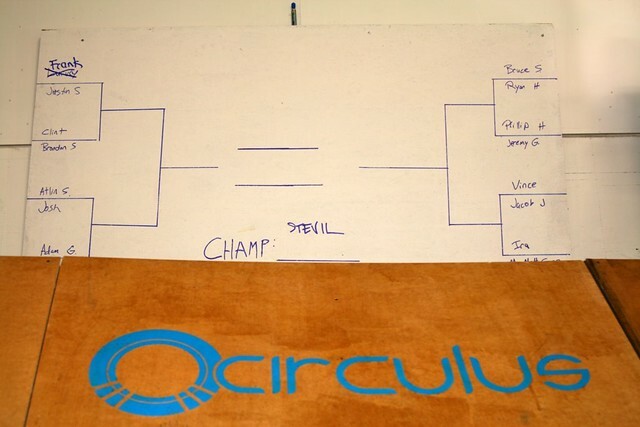 The object of the race was to complete 4 laps before your opponent or to catch the opposing racer in 4 laps or less. 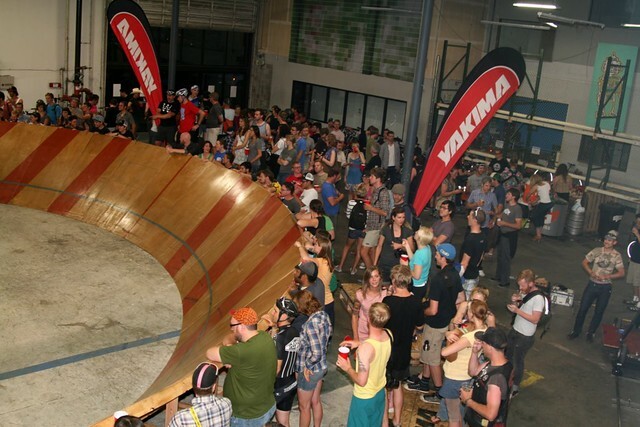 Although adult refreshements were available from Hopworks Urban Brewery, racers were not allowed to drink them until AFTER their heat was completed, as this was a single elimination race format. If you were fortunate enough to advance, you were unfortunate enough to have to wait to enjoy a cold beer! Having previous saddle time on Circulus, I gave it a go… Race testing the DZR District shoes. Here is JMaus in action! 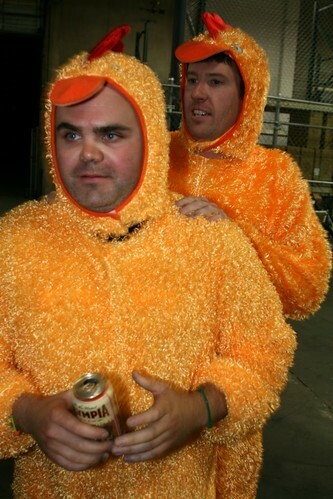 The racing ended for the evening with two of the haunches at PDW, Erik and Murph going…. Beak to Beak?? A big THANKS to the fine folks at PDW – Daniel “DPow” Powell, Erik Olson & Kevin “Murph” Murphy & Yakima for putting on a fantastic, fun filled event! Do You Like Bikes?? Do You Like Beer?? Check out the Hopworks BIKEBAR! Based on a recommendation from one of our readers (thanks, Mindy! 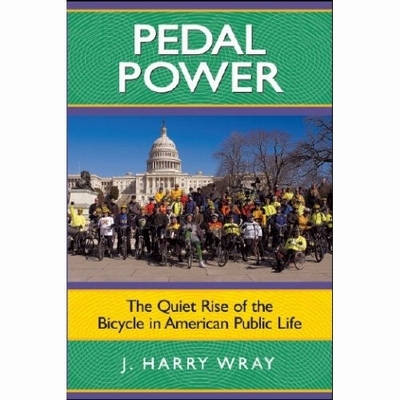 ), I just completed reading Pedal Power: The Quiet Rise of the Bicycle in American Public Life by J. Harry Wray (Boulder, Colo: Paradigm Publishers, 2008). I posted a passage that really resonated with me in a previous article…great food for thought. This book is a socio-political overview of the many advocacy groups, politicians and assorted bike-friendly clubs throughout the United States who are making real differences in terms of supporting the creation and maintenance of bicycle infrastructure, championing cyclists’ rights to the roads and fostering a growing bicycle culture here. The author is a professor of political science at DePaul University in Chicago and is known for taking his students on bicycle rides throughout the city to instill in them a sense of “how politics, economics and the environment combine to affect culture and be affected by it” (Pedal Power: “About the Author”). Wray begins by discussing the perceptional differences between motorists and bicycle users…how bicyclists tend to be more aware of their surroundings and thus more likely to notice changes and problems (and addressing them when discovered). 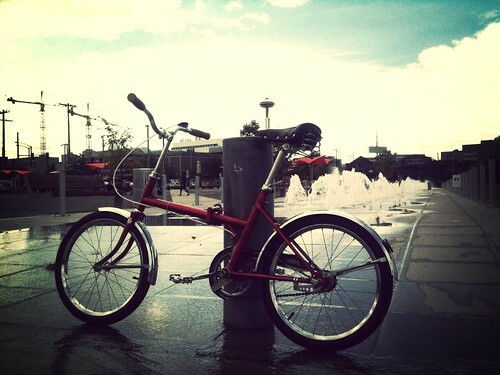 Using a bicycle as transportation in any city fosters a sense of community — and encourages the use of undiscovered and underappreciated public spaces that are completely foreign to motorists who spend most of their traveling time in their air-conditioned “private bubbles”, insulated from the world around them. Much of that will come as no shock to those of you who are regular commuters; we tend to “see” our surroundings differently because we are out in it every day, sometimes off the beaten path and in places most motorists will never travel. The author then spends some time talking about the Mecca of bicycle-friendly cities: Amsterdam. He discusses how cycling became such a dominant transportation choice there (and it wasn’t always the case there…it is a fairly recent phenomenon in the grand scheme of things). He talks about what changes were made and how they were supported there to make bicycling such an incredible force. 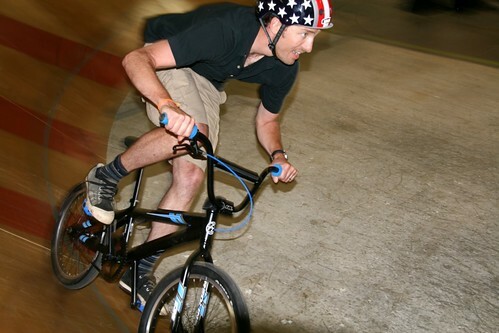 Then, he spends a few chapters covering some of the well-known bicycle advocacy groups, both on the national level (League of American Bicyclists and the Thunderhead Alliance) and regional or city-based groups (Chicagoland Bicycle Federation, Bike Portland, and others). He also introduces the reader to a variety of national, state and local-level politicians who are making real changes in how bicycles are treated during transportation planning and implementation — all the heavy hitters such as Jim Oberstar of Minnesota, Earl Blumenauer of Oregon, Anne Paulsen of Massachusetts, and Mayor Jerry Abramson of Louisville, Kentucky (yes, Louisville…they’ve got it going on down there! ), among others. This is an incredibly enjoyable and powerful book; it is never dry or overwhelmingly academic as I first feared…and is one that I feel should be required reading for newly-elected politicians entering office. In order for bicycling to thrive as a real transportation alternative in American cities, we need more bike-riding politicians on our sides — working from the inside to help create more bike-friendly communities. The book also suggests that the many smaller advocacy groups could possibly be better served by joining forces with each other and massing their muscle to get things done. I heartily recommend this book to anyone who wants to know more about how the bicycle is slowly changing the way Americans live their lives. This book may or may not be available at your local public library — I had to borrow it through inter-library loan (thanks, Nova Southeastern University Libraries! ), but had just enough pull with our book selectors at my library to order a copy for our collection. Power to the people!